Our next stop was the Mannarkoil. 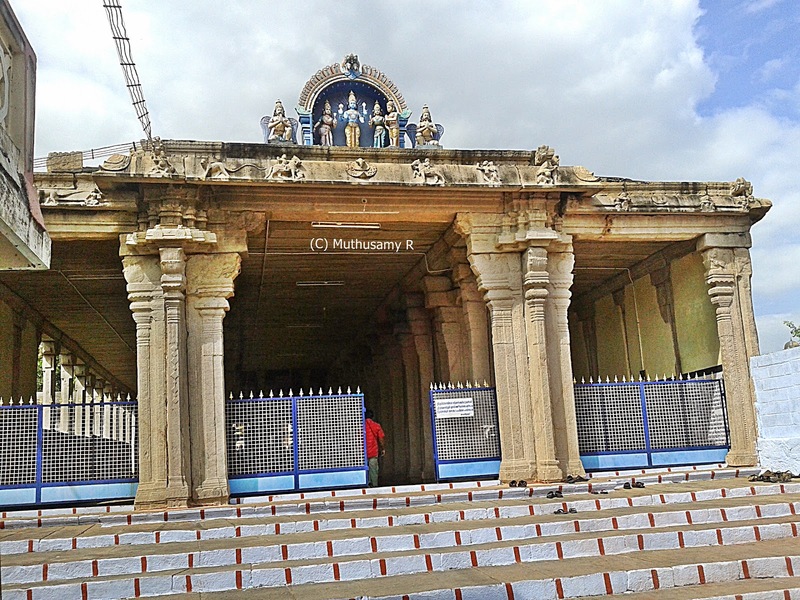 Mannarkoil Rajagopalaswamy Kulasekara Perumal temple is located at a distance of about 1 km towards west side from Brahmadesam Kailasanathar Temple. From Ambasamudram The town and the temple is situated at a distance of about 5 km from Ambasamudram off the Tenkasi – Kurtalam Highway. Mannarkoil is an island bounded by the Thamirabarani river on the south side, and the Ghatana river on the north side. The island looks like Srirangam near Tiruchirapalli. Rangam means island formed in between two river courses. Mannarkoil has always been in the pilgrimage itinerary in Tirunelveli district by the vaishnavite population. 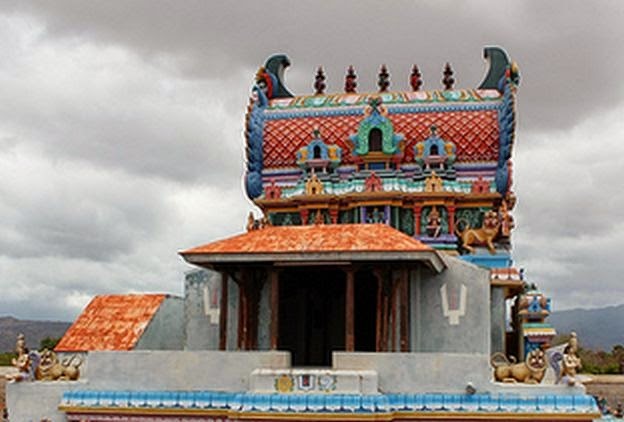 The historic Rajagopalaswamy Kulasekara Perumal temple (இராஜகோபாலஸ்வாமி குலசேகர பெருமாள் கோவில்) is situated on three sprawling acres of land in the village of Mannarkoil. The imposing perimeter walls enclose temple structures. The village and the temple are mentioned as Vedhanarayanpuram (sound of Vedas is always heard here) and Rajendra Chola Vinnagaram respectively in ancient records. 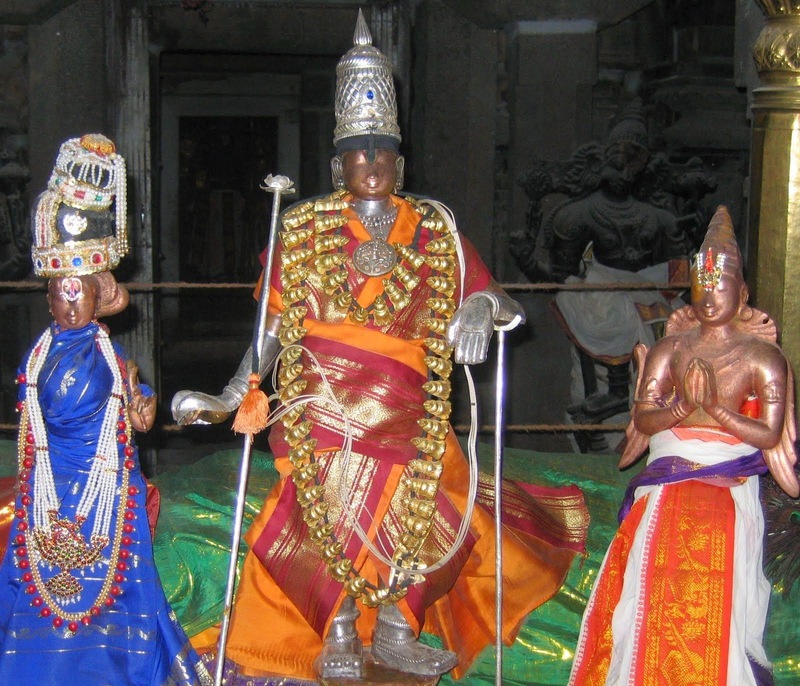 Consorts (Goddesses) : Vedavalli Thaayar (வேதவல்லித் தாயார்) and Bhuvanavalli Thaayar (புவனவல்லித் தாயார்). Time to visit : The temple is open from morning 7.00 clock till 12.00 noon and from 5.00 to 7.00 pm. Location: Mannarkoil, bound by two rivers Thamirabarani and Ghatana. About 5 km West of Ambasamudram Town. Located in the Tirunelveli - Senkottah Road. The village and the temple are located in an island surrounded by two perennial rivers - Tamirabarani and Ghatana. In the 10th century A.D., after the Chola conquest of Pandyan country, the riverine of Tamirabarani - Ghadana nadi was established as a Chola colony. Jatavarman alias Sundara Chola Pandya (1017-18 A.D), aka Chola Viceroy (feudatory of the Rajendra Chola I) formed new townships and converted the forest lands for cultivation. This temple is the Chola temple built in the Pandya country. Both the vimana and koshtam has Dakshinamoorthi (a form of Lord Shiva). This temple has some miniatures of Ramayana. The saint Kulasekara Azhvar spent his last 30 years in Mannarkoil and attained moksha here. Therefore Mannarkoil has become the Thiruvarasu Koil for Kulasekara Azhvar (திருவரசுக் கோவில்) (place where Azhvars join the feet of the Lord, is called 'Thiruvarasu' ) . As a token of respect, the temple authorities have aptly named this temple as Rajagopalaswamy Kulasekara Perumal temple. Mannarkoil is the birth place of Vaadhi Kesari Azhagiya Manavala Jeer (வாதி கேசரி அழகிய மணவாள ஜீயர்) who wrote extensive explanation (vyakgnanam (வியாக்யானம்) or urai) to Thiruvai Mozhi (திருவாய்மொழி) - 1102 hymns, composed by Nammazhvar (நம்மாழ்வார்), forming part of Nalayira Divyaprabandham (நாலாயிர திவ்ய பிரபந்தம்) or 4000 Tamil Hymns (Pasurams பாசுரம்). The title of the explanation is known as ‘Panniraayira Padi.’ (பன்னிரெண்டாயிரப் படி). Shri.Narasimha Gopalan Acharya, who belongs to the Periya Nambi ancestry, has taken single handed effort to renovate the temple from dilapidated state. He only received very minimal support from HR & CE. He is very keen in cultivating Shenbagam flower garden. His monthly salary seems to be just Rs. 245 only. The temple, built in the 11th century A.D., during the rule of the Chola monarch Rajendra Chola I (முதலாம் இராசேந்திர சோழன்) (1012-44 A.D.), has a very unique architectural design. Unlike the majority of the temples which have only one main sanctum enshrining the presiding deity, Mannarkoil has three vertically aligned sanctums, all facing east, one above the other, each housing one image of Lord Vishnu. The canonical texts call this style as ashtanga vimana. Ashtanga style of vimana, with three sanctums one above the other, was first built in the Vaikunda Perumal temple (வைகுந்தப் பெருமாள் கோவில்) aka. Parameswara Vinnagaram (பரமேஸ்வர விண்ணகரம்), Kanchipuram in 690 A.D., during the time of Pallava ruler, Nandivarman II aka Pallavamallan (இரண்டாம் நந்திவர்மன் என்ற பல்லவமல்லன்) (731 - 796 A.D.). Sri Sundara Varadaraja Perumal temple, Uttaramerur (சுந்தர வரதராஜப் பெருமாள் கோவில், உத்தரமேரூர்) was built in 750 A.D. during Pallava rule on the model of Vaikunda Perumal temple, Kanchipuram. But, as a unique feature, Uttaramerur temple ashtanga vimana has three more sanctums around the main sanctum in the three cardinal directions in the ground stage and first stage. There are nine Mula Virats (main deities) under the same vimana. Lord Sundara Varadaraja Perumal in the main sanctum and the deities present in the ground stage include Kalyanavaradhan (south), Achutavaradhan (west) and Anurudhravaradhan (north). Lord Vaikundavaran is enshrined the sanctum above the main sanctum in the first stage and the deities present in the first stage include Bhagvath-Gita Krishnan with Arjun (south), Yoga Narasimmha (Lord in half human half lion form) (south) and Bhuvaragan (Lord in boar form) with Lakshmi (north). There is also Sri Dhakshinamurthi on the vimana facing south which is unusual in Vaishnavite temples. Lord Ananthapadmanaban is enshrined in the second stage sanctum. 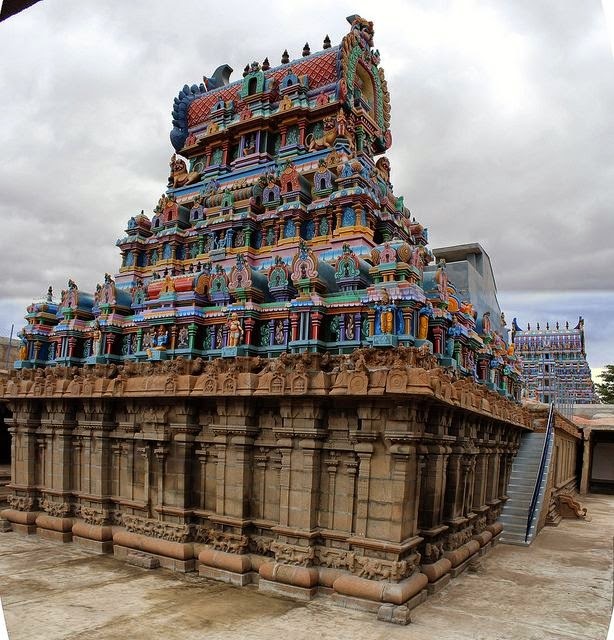 The other temples with ashtanga vimana include Sowmya Narayana Perumal (சௌமிய நாராயணப் பெருமாள்) temple in Tirukoshtiyur, Sivagangai district; Sri Koodalazhagar Perumal (கூடலழகப் பெருமாள்) temple, Madurai; Raja Mannar temple, Srivilliputtur; Sri Aadhi Narayana Perumal temple, Cheranmadevi; and Ashtalakshmi temple, Besant Nagar, Chennai. The two tier (dvi-tala) ashtanga vimana is having the Chola style of architectural features. The base vimana structure (from adishtana to prastara) is made out of hard granite stones. The super structure is made of brick and lime mortar mixed with palm sugar. The plinth (prathivari bandha adishtanam) of the sanctum includes jagathi, round (vritta) kumudham, prati or pattika. In between the wall and the basement the vedika component with a frieze of Vyala vari (row of Leogrif motif) elements is shown. The entire pada portion of the vimana is divided into three segments called the pathis or bhadras. The projected corner pathis are called as karna pathis or karna bhadras. In between karna bhadras is projected rectangular sala pathis or sala bhadra. Between karna bhadras and sala bhadras comes koshta panjaras flanked by spilit pilasters. Usually the koshta panjaras will have shrines, but here it is empty. In between the kapota and first tala is shown another vedika component with a frieze of buta-vari. Each tier of the vimana, above the kapota with kudu arches, is formed with regular arrangement of karna-kuta (square shrine placed on corners), panjara, sala (oblong shrine placed on sides), panjara, sala and karna-kuta. Lord Veda Narayana Perumal (வேத நாராயணப் பெருமாள்), presiding deity of the historic Mannarkoil temple is enshrined in the main sanctum which faces east. The imposing image is seen in standing posture holding the conch (sankha) and discus (chakra) in his upper hands. The lower right hand in abhaya hasta mudra and lower left hand resting on his hip and flanked by Ubhaya Nachiyar (Sri Devi and Bhu Devi). Lord is composed of stucco (sudha) of herbals (வர்ண கபால திவ்ய திருமேனி). The two sages Markandeya (மார்கண்டேயா) and Bhirgu (பிருகு) also appear with folded hands. The Rajagopalaswamy, the bronze processional deity appear along with goddess Andal and Garuda in the main sanctum. Also there are bronze icons of Sri Rama, Sita, Lakshmana and Hanuman found in this sanctum. A small and cute Garuda idol is located before the main sanctum. Also there are flagstaff and balipeeta before the sanctum. A narrow flight of stairs, leading to the first stage has been constructed on the south prakaram of the main sanctum on the ground stage. The Lord appears in sitting posture in the first stage of the ashtanga vimana. A small hole or gap (Pillai Thondu) is found before the sitting perumal. In Tamil 'Thondu' means way. The women beseeching child boon will pass through this 'Pillai Thondu' as part of their votive prayer to the Lord. Another flight of stairs with narrow width leads to the second stage of vimana. At the second stage still above the first stage the Lord appears reclining on Adisesha. The reclining Perumal has two two different prakaras 1. broader elephant pass (yanai thondu or yanai mudukku) and 2. narrower cat pass (poonai thondu or poonai mudukku). There is a wooden mandapa before the reclining Perumal. The roof of this mandapa has the carved images of zodiac signs. The shrines in the first and second are built with lime mortar and palm sugar. Thus Lord Veda Narayana Perumal graces his devotees in three postures – standing, sitting and reclining. The east facing temple has single entrance and two prakarams, an ardhamandaba, mahamnadaba, connecting mandaba surrounded by a cloister mandapa (திருச்சுற்று மாளிகை) around the main sanctum. There are separate shrines for goddesses Vedavalli and Bhuvanavalli in the circumambulatory path. The circumambulatory path also has separate shrines for Lord Narasimha and Viswakshena. The stucco images of both the goddesses appear seated. 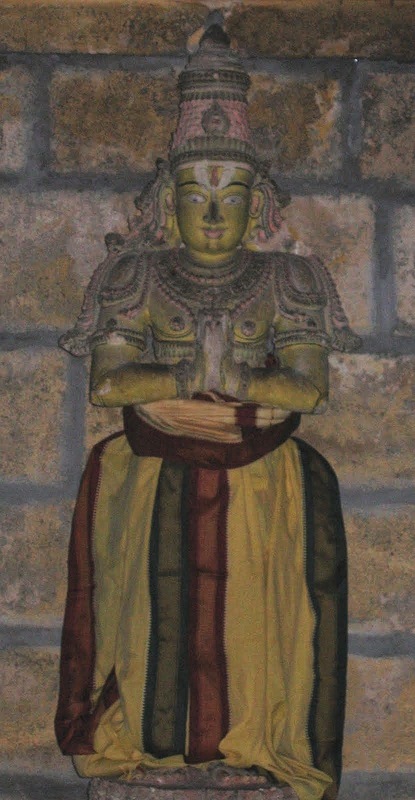 Vaishnava saint Kulasekara Azhvar (stucco image) is enshrined in a separate shrine in the northern prakara with separate flagstaff and balipeeta before the sanctum. The sanctums of two Vaishnava acharyas Ramanuja and Manavalamamunigal are located in two separate mandapas. This elaborately decorated structure exhibits typical of the Nayaka architectural style with exquisitely carved composite pillars. There are life size statues of Lord Rama and other gods, kings with folded hands forming part of the monolithic pillars. The Mannarkoil region was once dense forest with jack trees. After paying visit to many holy shrines, sages Brigu and Markandeya reached Mannarkoil for penance. 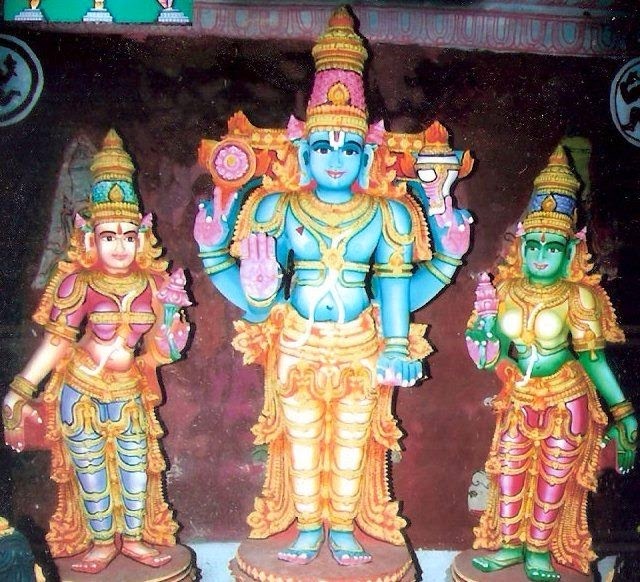 They prayed the Lord to appear before them in his three postures (standing, sitting and reclining postures) and Lord Veda Narayana Perumal appeared before them in the same way. The sages expressed their wishes to the Lord and prayed the Lord to appear before one and all who manage to visit this shrine and bless them for happiness and prosperity. Lord gave his consent and decided to stay at Mannarkoil and continue to bless all devotees. The Tamirabarani - Ghadananadi river region was established as a Chola colony after the Chola conquest of Pandyan country in the 10th century A.D. Jatavarman alias Sundara Chola Pandya (1017-18 A.D), the Chola-Pandya king aka Chola Viceroy (feudatory of the Rajendra Chola I) formed new townships and converted the forest lands for cultivation. 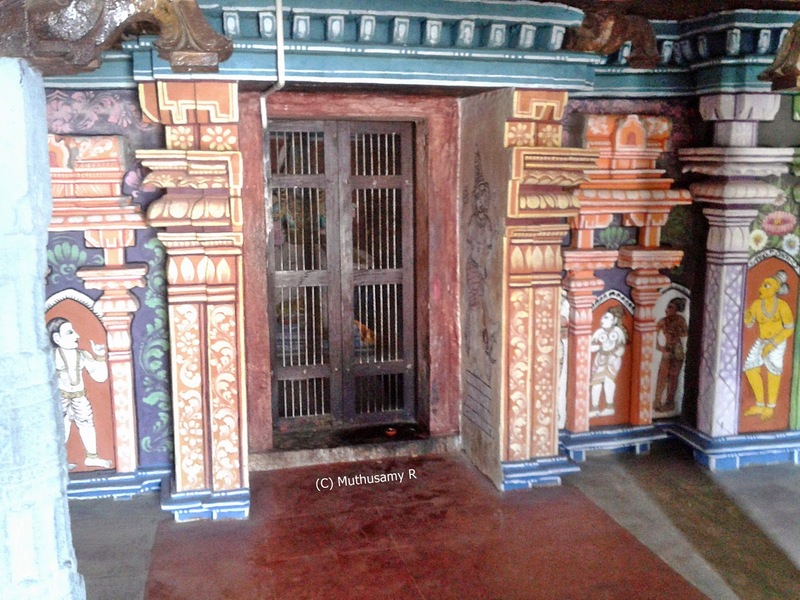 The inscriptions at the Veda Narayana Perumal temple at Mannarkoil village informs us that the big Brahmadeyam village of 'Rajaraja Chaturvedi Mangalam' in Mullinadu in the 'Mudikonda Chola Valanadu' of Raja Raja Pandinadu was made over to Brahmins as gifts. 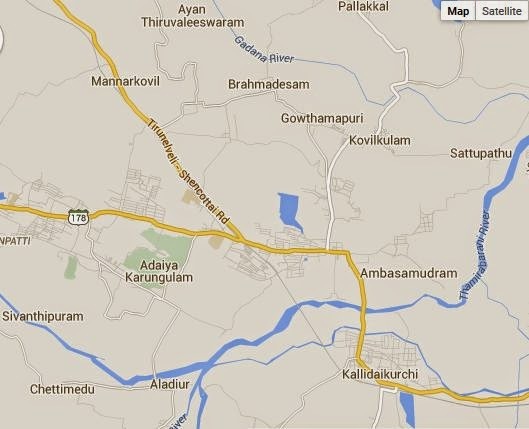 The hamlets of 'Ilangokudi' (today's Ambasamudram), Kallidaikurichi, Aththala Nallur, Vazuthiyoor, Alwarkurichi and Pappankurichi were parts of this big Brahmadayam village (now Brahmadesam). Rajagopalaswami Kulasekara Azhwar temple, a Chola temple in the land of Pandyas, was built by Chera king Rajasimha (1028- 1043 A.D.) with the permission of Rajendera Chola I. The Chera has also donated land to the temple at a later date. The village is also known as Rajendra Chola Vinnagaram, named after the Chola monarch Rajendra Chola I, who has made significant contribution to the temple. Jatavarma Chola Pandya has also made considerable contributions. Finally there are contributions from Nayaka rulers. Kulasekara Azhvar, one of the twelve azhvars and believed to be a king from Kerala region (some other consider him as ruler of Kolli hills or Madurai Koodal or Kongu regions). During his early years, he conquered Chola and Pandya kings and was a force to reckon with. Lord Vishnu blessed him with spiritual insight and led him to renounce power and sing hymns in praise of the Lord and the shrines of the Lord. After having darshan of Lord in several shrines, the Azhvar reached Mannarkoil and he had an emotional attachment with Lord Rajagopalan. It is believed that Kulasekara Azhvar brought away the bronze idol of Lord Rajagopalan from Mannargudi forcibly since he showed intense emotion with Rajagopalan. His aradhana idols Sri Rama, Lakshmana and Sita are being worshiped here as ablution deity (abhisheka moorthy). The saint spent his last 30 years in Mannarkoil and attained moksha here. Therefore Mannarkoil has become the Thiruvarasu Koil (place where Azhvars join the feet of the Lord, is called 'Thiruvarasu' ) for Kulasekara Azhvar. As a token of respect, the temple authorities have aptly named this temple as Rajagopalaswamy Kulasekara Perumal temple. His shrine is unusually provided with flag post and bali peetam. Surprisingly Pandya country is known for many 'Thiruvarasus' of Azhvars: Nammazhvar Thiruvarasu at Azhvar Thirunagari (Tamarind Tree), Periazhvar Thiruvarasu at Alagarkoil; Tirumangaiazhvar Thiruvarasu at Tirukurungudi (Malaimel Nambi). According to Ep. Ind., Vol. XI, pp. 294 the Chera king Rajasimha was a contemporary of the first viceroy Jatavarma Sundara Chola Pandya. Inscriptions mention about the existence of Temple Mahasabha empowered to register all the land grants from monarchs - Chola and Pandya rulers. The land grants were realized when these rulers camped in near by places like Velaikurichi and Kallidaikurichi. In this way there are references about the gifting of the village of Velancholai (வேலன்சோலை or வேலஞ்சோலை) to the temple. The 4th year reign - inscription records some decisions taken in the meeting of the assembly held in a hall of the ambalam about the land and houses granted to the gardeners, drummers, potters, garland makers, torch bearers and temple dance girls (devaradiyar). Location: on the south wall of the temple, (ARE No 107 of 1905 - SII Vol XIV 132). On the 139th day in the 13th year reign - inscription records the details of land sale by the sabha of Rajaraja Chaturvedimangalam to the temple. The 14 and odd veli of land in extent was regrouped into a new hamlet called Sola Pandyanallur and converted into a tax-free devadana. (Ref: ARE No. 109 and 144 of 1905) Location: on the west wall of the temple (ARE No. 110 of 1905 - SII Vol XIV 145). 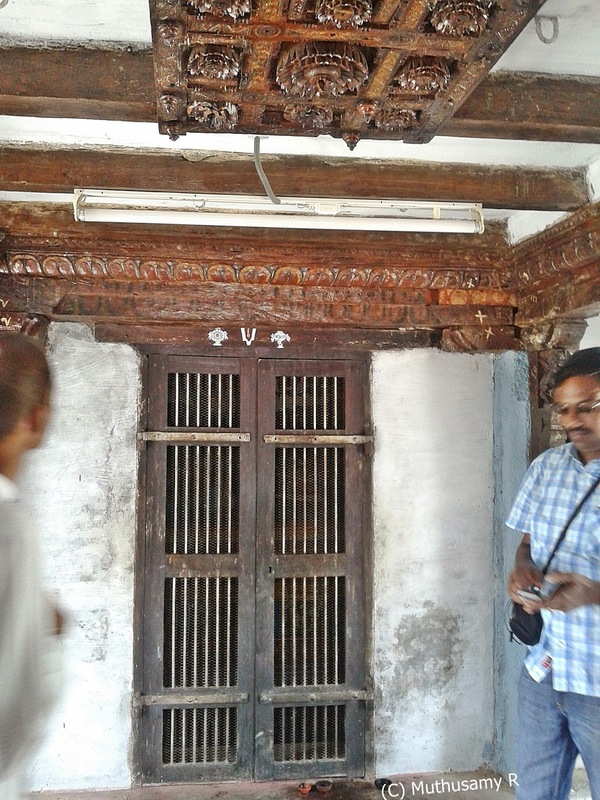 In the 14th year reign - inscription registers the sale of the village Manabharana Chaturvedimangalam, a brahmadeya in Mulli Nadu, which was the property of two brahmanas of Nigarilisola Chaturvedimangalam named Govindan Madhava bhattan and Govindan Tiruvikraman, to the temple. Also records that the brahmanas had originally obtained the village as the gurus of the ruling dynasty. Location: on the north wall of the temple (ARE No. 106 of 1905 - SII Vol XIV 148). In the 18th year reign - inscription registers the sale by the sabha of Rajaraja Chaturvedimangalam to the temple. Location: on the north wall of the temple (ARE No. 109 of 1905 - SII Vol XIV 144). Another inscription records gift of land to 12 brahmins who had settled down in the village from towns such as Thirukurungudi, Tirukurugur (Azhwar Thirunagari) and Thirumaliruncholai (Azhagar Koil), in recognition of their recitation of the 'Thiruvaimozhi' in the Thiruvaimozhi Mandapam (even now called in the same). One more inscription records to the Mahasabha accepting the legacy of land from two widows only after their male relatives had agreed to the land being gifted to the temple. In cases where the signatories to a contract were illiterate, others had signed on their behalf. Two other inscriptions record routine matters like 1. the appointment of Sankaranayanar as the dharmakarta in Kollam year 764; and 2. the gift of land to some common people like the temple watchman. 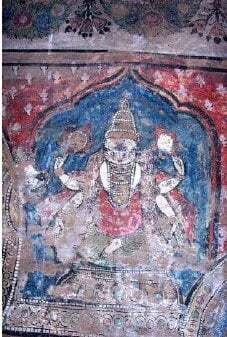 The author in his article Paramount Public cry for preservation of India’s Cultural Heritage refer to the defacement of mural paintings in this temple. 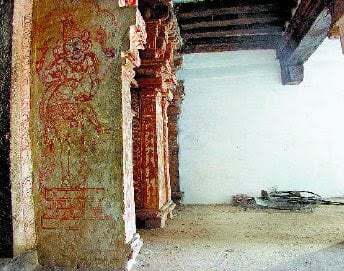 His photographs (shown here - taken three years ago) show some surviving mural paintings juxtaposed with the white washed wall on the right where a ceiling-high painting of Lord Narasimha once existed. A number of festivals are celebrated in this temple. The temple is agog with activity during the Chithirai Brahmotsavam is conducted in the Tamil month Chithirai (April - May). Procession of Azhvar Pushpa Pallakku (flower palanquin) and Teppotsavam (float festival) in the Tamil month Thai (Jan - Feb). Mannarkoil village is located about 5 km from Ambasamudram on the western side of Tenkasi - Kutralam Highway. Ambasamudram is is 35 km Tirunelveli. Plenty of buses are plying from Tirunelveli as well as from Tenkasi.